The President signed EO 12, demanding that the RH Law be implemented nationwide. Unfortunately, unless the Supreme Court lifts its TRO, the RH Law isn’t going to be upheld, no matter what the President says. To find out what you can do to help get the Supreme Court to lift the TRO, read the end of the article. At the rate things have been happening in the Philippines, what was fresh news becomes stale seemingly faster than the speed of light. Early this month, President Rodrigo Duterte signed Executive Order (EO) 12, which implements Republic Act 10354 or the Responsible Parenthood and Reproductive Health Act of 2012. The EO is part of the administration's 10-point socio-economic agenda that aims to provide poor couples with opportunities to make "informed choices on financial and family planning." With regard to this, it aims to have "zero unmet need for modern family planning" by 2018. Though the RH Bill became the RH Law in 2012, after a 14-year battle, its implementation has been blocked by a temporary restraining order (TRO) issued by the Supreme Court. This is unfortunate because the RH Law would have been able to help the at least six million Filipino women who do not have access to contraception. The Presidential move was lauded by even the President's critics like Albay Rep. Edsel Lagman, one of the primary authors of the bill, as well as global agencies like the United Nations Population Fund and local women’s rights groups. The Executive Order includes orders for relevant government agencies like the Department of Health (DOH) and The Department of Interior and Local Government (DILG) to collaborate with all Local Government Units (LGUs) to properly implement the RH Law. It tasked the Department of Education (DepEd) to formulate a "gender sensitive" and "rights based" curriculum to be taught in schools, and the Department of Social Welfare and Development (DSWD) has been made responsible for integrating RH strategies into its programs. In other words, The President wants the RH Law implemented in full force, now na. There's a Monty Python skit that pokes fun at Roman Catholicism's obsession with creating children (as well as Protestantism's conversely sterile approach to the same thing). Despite democracy’s dictum to separate church and state, we all know that the Catholic church is still very much in control of how things are run, especially with how things are run in terms of women’s bodies. Even in this day and age, a bunch of men think that they know more about regulating women's bodies than the women themselves. Male-dominated institutions such as the Catholic church and the Philippine senate preach about the evils that befall the people who decide to use contraception without acknowledging that reproductive health maintenance—and this is more than just deciding to not have babies—have actually improved—even saved the lives of women and children all over the world. This is why, in a developing country such as the Philippines, a reproductive health law especially benefits the population as a whole, and not just in terms of family planning. Unfortunately, despite the promise that the EO presents, all is not as cut and dried as it seems, at least at this time. 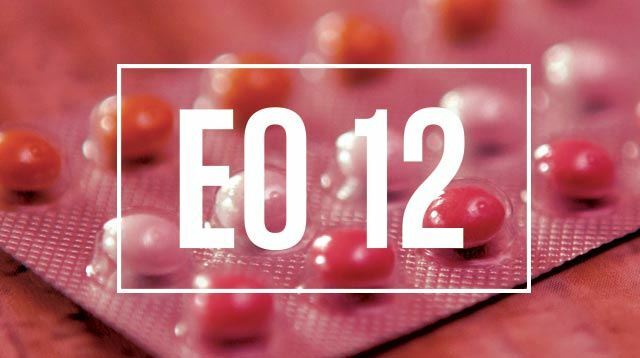 According to RH activist Elizabeth Angsioco, the TRO that is still in place will not only give government officials who disagree with the EO an excuse not to comply with it, it will also deplete the country's supply of contraceptives until it is unavailable to those that need or want it altogether. SC's TRO: Ang dakilang MH ng bayan. "The RH's law's IRR (Impending Rules and Regulations) has been in place since 2013. The EO is good in as far as giving the marching orders to various offices under the Executive (branch), particularly LGUs, to implement family planning," Angsioco says. "There are many problems on the ground especially because 1. Some mayors are anti-RH & refuse to implement the law; and 2. The chilling effect among local implementers brought about by the SC ruling which has resulted in very uneven FP (Family Planning) programs in communities. We know because we help implement the law locally as NGOs." "The EO is a clear order that FP must be implemented. It also contains some important strategies that need to be done or strengthened," Angsioco says. "The offices ordered by the EO are also mandated by the RH law for its implementation. Thus, it is their responsibility." No lifting of TRO = no contraceptives. In the whole country. "However, this EO cannot succeed if SC fails to lift TRO on implants and reverse its August  decision. These promulgations make a total stock-out of contraceptives a real possibility," Angsioco says. "There cannot be modern family planning without contraceptives. It must be noted that because of these SC rulings, even those who have money to buy their contraceptives will not have access when nothing is [in] the market." "The EO does not and cannot override the SC decision. The EO tells various government departments under the Executive (judiciary and legislative branches excluded) to implement the RH Law, particularly family planning. This is good because now, LGUs are given the marching order. However, doing FP is dependent on the availability of supplies especially contraceptives. The SC decision, on the other hand, has to do with registration and certification of contraceptives. Note that no medicine can be available in the market or in the public health system without a valid registration and certification. The FDA is responsible for such." The TRO is pro-fetus, but anti-family, anti-child, and anti-woman. 1. Opponents of #RHLaw must be heard in the processing of contraceptives' registration and certification. Note that FDA is a regulatory body. It's supposed to operate based on medical findings, and scientific evidence. SC wants this done on every contraceptive. Note, too, that of all meds and drugs, SC wants this done only for contraceptives. 2. All FDA decisions are appealable to the Court of Appeals. This does not only make the registration process very long because of our legal processes, it also changes the mandate of the FDA from being purely regulatory to being quasi-judicial. It begs the question, are lawyers and judges capable of deciding what is mainly a medical question? 3. When there is substantial doubt, cases should be decided on the side of the protection of the life of the unborn. It appears that the SC totally neglected women's welfare & rights here. Our Constitution guarantees EQUAL PROTECTION OF THE LIFE OF THE MOTHER AND THE UNBORN. Where is protection of the mother’s life in the SC decision? If FDA just follows these SC decisions, imagine what will happen. So the DOH and FDA filed a Motion for Reconsideration of the SC decisions." "If the SC does not reverse its decision, government and private corporations will not be able to purchase contraceptives and can only use what is presently there. Therefore, even with the EO, if stocks will not be available, women will not have access to contraceptives," Angsioco says. However, all is not lost. The SC has been asked to lift TRO by concerned citizen organizations and by more logical politicians. But the most important work has to be done by regular citizens like you and me. "The SC is the only entity that can lift TRO and reverse the August  decision," Angsioco says. It is up to us as responsible citizens, and female ones at that, to pressure them to lift the TRO. 1. Express your opposition to the TRO in both social media and mainstream media. Keep the issue in the social consciousness by posting about RH-related issues and continuing to call for the SC to lift the TRO. Share your personal stories: Has family planning helped or hindered you or a member of your family? Have you had trouble buying contraceptives? How has this made an impact on your life? 2. Sign & encourage others to also sign the online petition to lift the TRO. 3. Support NGOs that provide reproductive health education and contraceptives (particularly implants) to poor women. This can be done by donating cash or ancillary supplies, especially pregnancy test kits to these NGOs. If donating cash, NGOs should issue receipts for the donations. 4. If you have the time and inclination, you can do volunteer work with NGOs that provide free family planning and RH services to poor communities. You can also share your experiences on social media afterwards. That’s three birds with one stone—you get to help families in need, look good on social media, and collect good karma!